In the wake of the deadly school shooting in Parkland, Florida, earlier this month, Democratic lawmakers and gun-control advocates have argued that a full ban on "assault-style" weapons and high-capacity magazines is the only way to ensure the safety of children in educational institutions, but school administrators across the country have other ideas in mind. Some school districts have already implemented, and more are now considering, giving teachers and other employees the option to carry a concealed weapon on school grounds. The Federal Gun-Free School Zones Act, passed in 1990 and signed by then-President George H.W. Bush, made it unlawful for individuals to knowingly carry loaded or unsecured firearms within 1,000 feet of a school zone. The law—which applies to public, private, and parochial institutions—included a provision to allow firearms on school premises if they are used in a program approved by the school board or are in accordance with a contract entered into between a school and an individual or an employer of the individual. That section of the bill has sparked the interest of school administrators in finding innovative alternatives to ensuring the safety of students and employees, while not undermining the budgetary commitments their institutions have to provide a quality education. Ensuring school safety is officially supposed to be the domain of school resource officers, sworn law enforcement officers responsible for "safety and crime prevention in schools." Since the recession depleted local revenue sources, however, school districts have found it increasingly difficult to find the funds needed to cover their total operating expenditures, let alone an extra staff member. A study conducted by the Department of Justice in 2010 found that there were an estimated 13,056 full-time local police officers serving the country's over 98,000 public schools as school resource officers. The study, which did not account for parochial or private schools, found this was at least 1,300 fewer than the number in 2003. The Department of Justice did not repeat its study after 2010, so the exact number of school resource officers today is unknown. According to a 2015 report by the National Center for Education Statistics, however, only 30 percent of public schools surveyed had at least one full-time or part-time resource officer on campus at least once a week. The Lexington Herald-Leader first reported on Tuesday that a school district in Pike County, Kentucky, was considering allowing teachers and school employees the ability to carry concealed firearms on school premises. The decision came on the heels of school shootings at Marjory Stoneman Douglas High School in Parkland, which left 17 dead, and at a western Kentucky high school, which left two dead in January. Under the proposal being considered, employees of Pike County Schools would be eligible to volunteer to serve as concealed-carry guards. The volunteers would have to clear a background check, drug test, mental evaluation, and pass a rigorous evaluation course led by the local sheriff's office to ensure they are properly trained in firearms safety. Pike County Schools Superintendent Reed Adkins told the Herald-Leader that the decision to allow teachers to serve as concealed-carry guards was not easy, but it was one he was willing to take to ensure the safety of all the children in his district. "You hope you're making the right decision for kids, but I know right now something's got to be done," Adkins said. "We may be criticized, but at the end of the day I'll take criticism to protect my students." A study conducted by the Kentucky Center for School Safety found there were roughly 230 resource officers in over half of the state's counties. The initiative under consideration in Pike County is similar to measures adopted by the Clarksville Public School District in Arkansas. Clarksville made the decision in 2013 to invest in training district employees to serve as concealed-carry guards after the tragic shooting at Sandy Hook Elementary school. Clarksville Public Schools Superintendent David Hopkins told the Washington Free Beacon the choice was influenced by needing to balance the everyday economics of running a school district, especially in the face of shrinking revenue sources, with protecting the lives of students and teachers in an increasingly volatile time. "Part of what drove us to do what we did was the funding and logistical challenges facing school districts across the country," Hopkins said. "I can hire a school resource officer for $50,000 to $60,000 annually but that's only one person. This program has allowed us to train nearly 20 people for that same price," Hopkins added. "Furthermore, the annual costs to ensure those individuals comply with evolving safety standards are nearly half what it would cost to have one resource officer on staff." "Given the climate and atmosphere, the only way to prevent another tragedy, like the one that recently occurred in Florida, is to ensure that there are armed guards in schools," Hopkins said. "We're doing that." 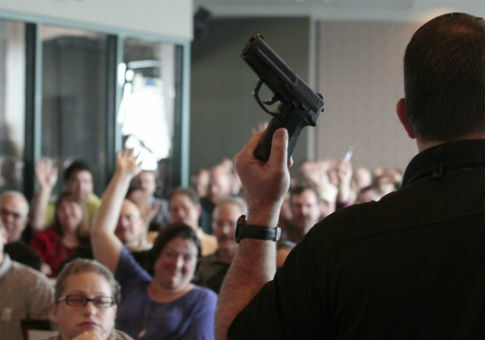 Proposals to allow teachers and other school employees to carry concealed weapons are picking up steam across the country. On Wednesday, legislation empowering individual school districts to set their own policies on allowing staffers to carry guns on school campuses cleared an initial hurdle in the Tennessee House of Representatives. As the impetus for action, the legislation's sponsors cited the fact that only 40 percent of Tennessee public school students are protected by school resource officers. The momentum followed the lead of states like Utah and Texas, which have allowed individuals to hold firearms on school premises with a concealed carry permit for years. In Texas alone, there are 172 school districts where teachers are allowed to do so, according to a review conducted by the Texas Association of School Boards.